This post appeared originally in MedPage Today, where I wrote it as part of our pricing transparency partnership with MedPage Today. Re-posted with permission. The email came from Kimberly Greene-Liebowitz, MD, MPH, who works at CityMD, the New York area urgent care chain. A practicing doctor, and possessor of a master’s degree in public health, she found us when researching costs, and reached out with a sense of deep outrage. Her provider was Phelps Memorial Hospital in Sleepy Hollow, N.Y., and the insurance company is Anthem Blue Cross via her husband’s employer. We know mammogram costs can vary widely, though we have learned that cash rates for a regular screening mammogram (without ultrasound) in the New York area can range from around $50 to $1,126, according to our survey of providers and contributions from community members. When we did our crowdsourcing partnership with WNYC public radio in New York about the price of mammograms, we learned that prices and payments vary widely, but we commonly heard that women were getting a mammogram and an ultrasound for somewhere around $800. We wrote about that here and here. What was prescribed and why, I asked? It was a diagnostic mammogram, not preventive, so not automatically covered under the Affordable Care Act? She and her husband pay annual premiums of $2,408.90, and their policy has an annual deductible of $5,700 and annual out-of-pocket maximum of $9,500. 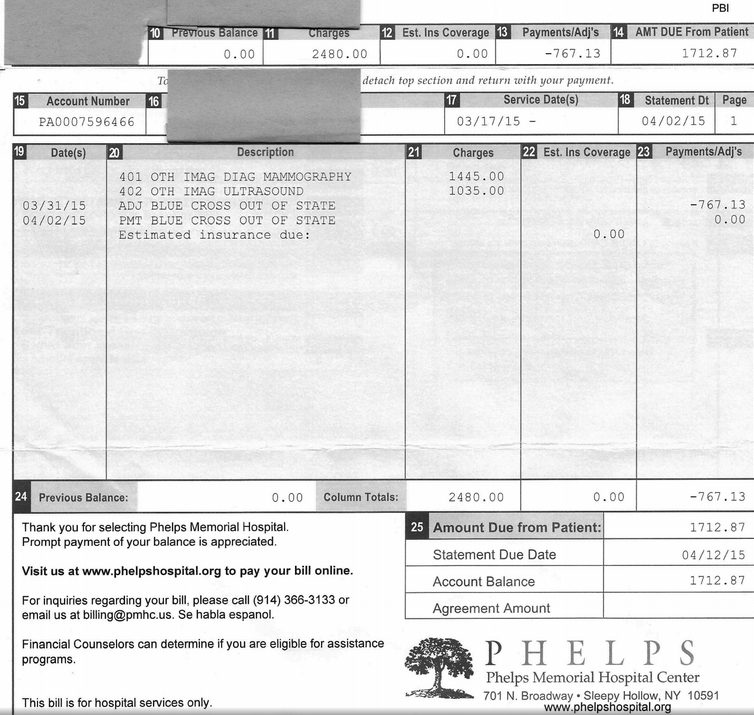 The bill from Phelps was for $2,480, but the EOB has total charges as $2,718.82, confusingly. Both helpfully have the same thing for “your responsibility,” that $1,712.87. The hospital bill listed $767.13 as “ADJ BLUE CROSS OUT OF STATE,” meaning, we surmise, the negotiated rate between hospital and provider is $1,712.87. The EOB says “amount allowed by your benefit” is $1,712.87. Phelps recently joined the North Shore-Long Island Jewish hospital system, after a number of years as a member of the Stellaris network in Westchester County. I asked how the actual bill was figured, and if she could explain the $2,480-$2,718.82 difference. Next stop: the insurance company. After Greene-Liebowitz filled out a HIPAA privacy waiver, I talked with Dr. Scott Breidbart, chief medical officer of Empire BlueCross Blue Shield, by phone. I asked him about the charges. For a diagnostic bilateral mammogram, CPT code 77056, “we allowed $866,” he said. (Medicare pays $132, according to the Medicare Physician Fee Finder.) 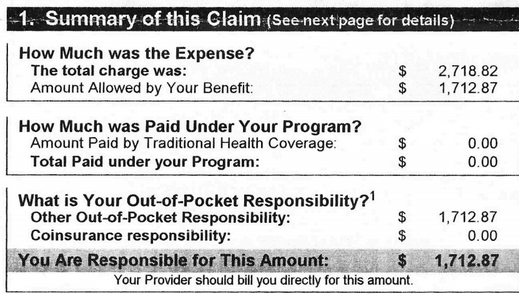 The second procedure, an ultrasound, CPT 76641, is $715 (Medicare pays $130.83); the third, a computer-aided diagnostic charge, CPT 77051, for this year is $132 (Medicare pays $11.23). Had Greene-Liebowitz called, Breidbart said, the insurer would have told her to go to a less expensive place — probably a radiologist’s office. But how is she to know that? I asked. Is it fair to expect her to call? And isn’t it true that both hospital and insurance company are notoriously bad at phone service for insured people, and generally at explaining costs? “It does upset people when the money comes out of their pocket,” he said. Greene-Liebowitz ultimately paid the bill, she said, because of the fear of an unpaid bill compromising her credit score. The fact that she’s extremely well educated and conversant with the health care system does not mean that she’s protected from extraordinary costs. It does make this a paradox of sorts: if Greene-Liebowitz is at risk, what about others? There are also reasons for perceiving the health care marketplace in new and interesting ways. I heard the other day from Dr. David Belk, a California physician who has made something of a study of billing. He is, not surprisingly, not a fan of insurance companies (most doctors share his opinions). He emailed a link the other day to a video he had done recently about why “insurance companies want hospitals and other health care workers to over-bill by so much.” Here’s the video. His belief: Insurers like blog posts such as this one because they frighten people into buying insurance. Jeanne Pinder is founder and CEO of ClearHealthCosts.com, a New York City startup bringing transparency to the healthcare marketplace. Check out the alliance formed between MedPage Today and ClearHealthCosts to tackle price transparency with tools for healthcare providers to join in the effort, and read more in a letter from MedPage TodayEditor-in-Chief Peggy Peck.